and a sanguine, cheerful still emotive performance. Leading vocalist of the band, Monika Lakatos is already well-known in Hungary, where she is considered to be one of the most powerful, soulful and authentic gypsy singers. She comes into the international musical world with own compositions of Romengo, as well as songs handed down generation to generation by his Olah gyspy family. Traditionally accompanied by archaic rhythm “instruments”, such as the tin can and wooden spoons, theses songs are pieced together with accompaniment of the guitar and the double bass and with the melodies of the violin. 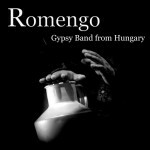 The result is a unique sounding which is not only a true testimony of the vitality and dynamism of the Olah Gypsy heritage but also shows the innovative inspiration, the festive and gathering music of Romengo. In 1994, encouraged by her community, and herself being enthusiatic to make an own repertoire, she became involved in the theatre “Holdvilág” where she was a singer, dancer and comedienne. Soon, her voice launched her on the Hungarian stages. She entered the famous national contest “Ki mit tud?” and won it in 1995. Between 2000 and 2003 she was a member of the band Rromano Drom. In 2004 she founded Romengo. Her talent and captivating voice evokes enthusiasm from both the audience and the experts. Mazsi was taught to sing traditional songs by his grandfather, senior Mihály Rostás, who was famous in Hungary as a gypsy storyteller. In 1995, Mazyi joined the theatre ‘Holdvilag’, where he met Monika who became his wife soon. From 2000 to 2003, he was guitarist, singer and percussionist in Rromano Drom and with this band he took part in many world tours. First he learned classical music also at the Béla Bartók conservatorium in Budapest. After having gradually fallen in love with Hungarian folk music, he started to play it in 2000. He learned from ifj. Csoóri Sándor, founder of the Muzsikás Együttes. He arrived to gypsy music through the gypsy violinists and melodies of Transylvanian Hungarian music. In 2005 it was János Guszti Lakatos who heard him once playing and invited him to a rehearsal of Romengo. He got captivated not only by the music, the voice of Mónika, but also by the way of how they treat each other and him. Since then he’s very happy and honoured to have an inner insight in the living Gypsy tradititions. From 1984 to 1997 he played and danced in the ensemble Ando Drom. As a member of this group, he gained international fame, made three albums and had the pleasure of playing with many famous artist (e.g. Monika “Mitsou” Juhasz Miczura, “Bratsch”, “Chico and the Gypsies”). From 1998 till 2001, he was the member of Rromano Drom. In 2004, he was one of the founders of Romengo. Participation in documentary film “Music Dialogues on the Danube River ”. Diffusion on France International and Euronews.